Basset Hounds have many distinct characteristics the lead owners in a variety of directions when trying to decide on a name. The breed is well-known for having rather large ears. Names of cartoon characters with big ears are popular choices for Basset Hounds. A few common selections include Bugs, Mickey, Goofy, Dumbo, and Pluto. Wingnut, Sonar, Satellite, and Keebler are some of the more humorous ear-themed options. Another notable attribute of Basset Hounds are their short legs. There are many relatively short NBA stars that have made their mark on the game of basketball. Muggsy, Earl, and Spud are names borrowed from some of the best and shortest known to the sport. In baseball the shortstop is one of the key positions in the field. Name choices taken from famous shortstops include Ozzie, Ripken, Jeter, and Wagner. No discussion of the defining characteristics of the Basset Hound is complete without mentioning their voice. 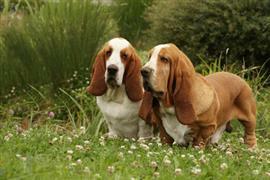 From howling to whining and barking, the Basset Hound speaks its mind freely and is not one to hold back communication. A few fitting names borrowed from renowned vocalists include Franklin, Presley, Lennon, Jackson, and Whitney. Other names related to sound include Siren, Thunder, Boomer, and Trumpet. Some of our pages will contain a subcategory. A subcategory is a slightly more specific grouping than the main topic of the page. For a subcategory, we will include a separated table of names and corresponding descriptions. An example of a subcategory of Red Dog Names would be 'Dog Names Inspired by Red Wines'. If you have any subcategory ideas for the Basset Hound Names page, we would love to hear them. Use the form below to submit your ideas.